More than 200 people gathered in London to commemorate the 60th anniversary of the atomic bombing of Hiroshima. CND and other peace campaigners organised the event at Tavistock Gardens, near where a bus was blown up in the 7 July London bombings. 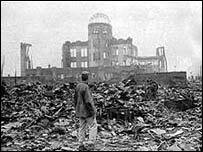 Around 140,000 people were killed by the Hiroshima bomb and its aftermath. In the Japanese city, nuclear survivors known as Hibakusha, attended the annual commemoration in the Peace Park, built at the epicentre of the blast. About 55,000 people thronged into the peace park to remember the moment the bomb exploded in the skies above the city, at 0815 on the morning of 6 August, 1945. Thousands were killed instantly and many others died later from severe burns or radiation. But CND chairwoman Kate Hudson said: "It is important that we mark the 60th anniversary by helping to bring about a real understanding of the horror of the nuclear bomb and the continued danger to the world of the nuclear weapons held by all of the nuclear weapon states, including the UK. "It is also vital that we challenge both the perception that it was necessary to drop the bomb on Japan and the idea that it would ever be necessary or justified to use it anywhere, ever again." She spoke at the event in London, which began at 1200 BST. Other speakers included Andrew Murray, chairman of the Stop The War Coalition and Labour MP Jeremy Corbyn. Mr Corbyn asked people to dedicate themselves to building a "world of peace, world of justice", adding: "That surely has to be the best answer instead of going down the road to more weapons of mass destruction, more anti-terror laws and more destruction of our civil liberties." The Reverend Elaine Dado, from St Pancras Church, said prayers and Councillor Barbara Hughes, from Camden Council, expressed sympathy to the friends and family of those who died in the July 7 bombings. Other events were taking place around the UK. The Hiroshima Day Remembrance Festival at Millennium Point in Birmingham had performances artists and musicians from across the country. Coventry Cathedral will marked anniversary by offering people a "service of reflection" with music, poetry and readings and silence. And in Scotland, vigils and other events were planned for Glasgow, Edinburgh, Dundee, Stirling and Dumfries.